Earlier this year I released a T-shirt design which related to having Type 1 Diabetes. Since then there have been several additions based on requests from other PWDs, and the collection has grown. 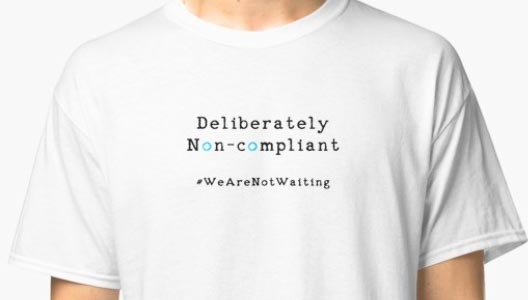 The “Deliberately Non-compliant” one you see above was inspired by Renza at Diabetogenic. In case you feel any of these would suit you, you can find the T-shirts in my collection at RedBubble. You have lots of choices of style and colour. If you choose a dark colour material you will want to use the white text, and with lighter colours use the black text versions.